Raise your sails and sharpen up those wrist blades assassins; Ubisoft is on the verge of releasing the latest chapter in their immensely popular Assassin's Creed series, and we were made privy to an impressive hands on demo of the game's PlayStation 4 version at a preview event at the Amsterdam Brewery on Toronto's beautiful waterfront on October 22, 2013. If you're a fan of Assassin's Creed, you needn't fear, because everything that has made the series so successful over six installments this hardware generation is well accounted for. There's a giant and historically accurate world to explore, historical figures to interact with, and plenty of toys to play with as you unleash your inner assassin. While Assassin's Creed III was a solid title that enjoyed widespread success, it was seen as a bit of a black sheep of the franchise and took a few noticeable steps back from the best of titles that came before. The story meandered, the side-quests felt like they didn't hold weight, and there was a disconcerting level of glitches and bugs. Given that this is a preview and not a full review, it's impossible to discern how many of these issues have been fixed for this installment, but it's obvious that the developers have taken the best parts of ACIII's mechanical gameplay and kicked it up a notch for Black Flag. 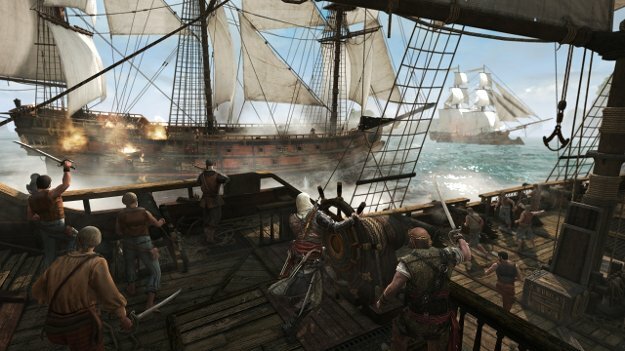 By far my (and many others') favorite part of ACIII were the naval battles that allowed you guide a crew to the high seas and take on other ships with cannons while maneuvering a giant frigate. The developers have taken this mode and practically expanded it its own game. 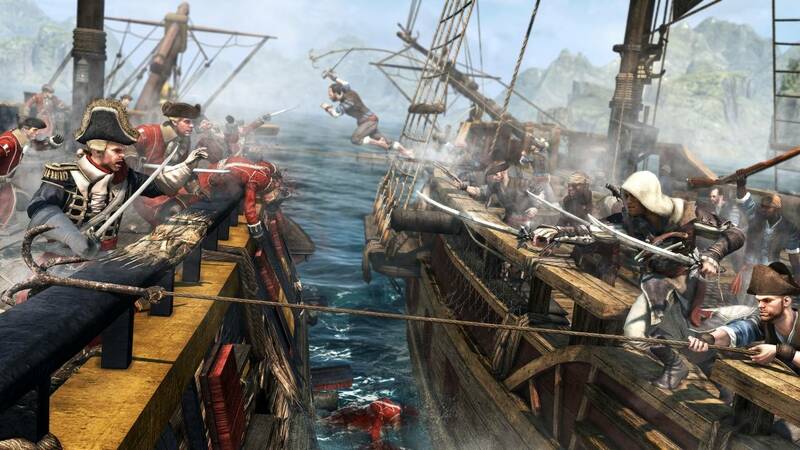 In a discussion with Associate Producer Sylvain Trottier, it was confirmed to us that the game is roughly 50 percent naval battles and gameplay and the remaining 50 percent is set on dry land. In addition to way more naval content, playing missions at sea or at land will yield experience and funds to upgrade both their ships and their playable character. Doing so will be essential as the open world will allow players to attack objectives that they may not be prepared for. The storyline moves chronologically backwards from ACIII. 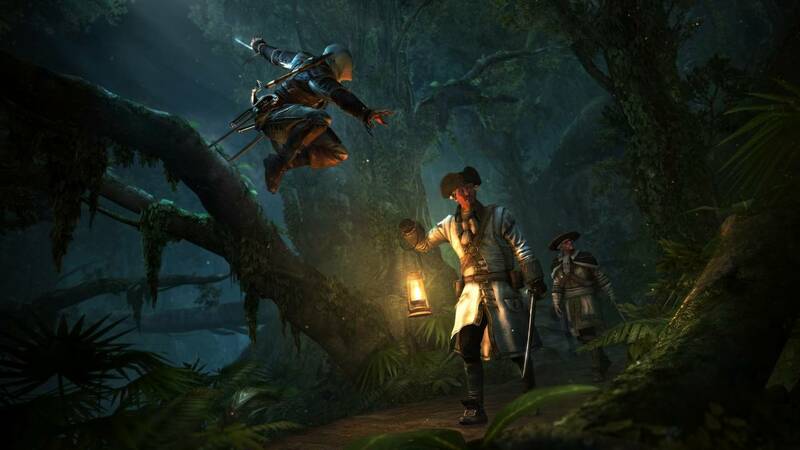 The main campaign's protagonist is Edward Kenway, a privateer who so happens to the father of Haytham Kenway and grandfather of Connor from ACIII. The plot will follow his adventures in piracy in the Caribbean between 1712 and 1722. 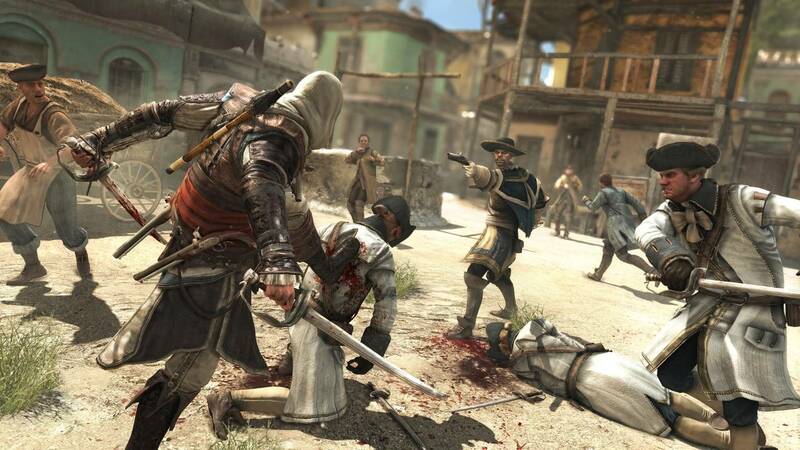 Trottier told us in our interview that the biggest priority with the game's story was to tell the true stories of that period of time while blending in the DNA of the series' overarching Assassins vs. Templars storyline. Given that Ubisoft has long been lauded for their storytelling throughout the series, we expect this installment to be no different. Historical accuracy begins with the setting. 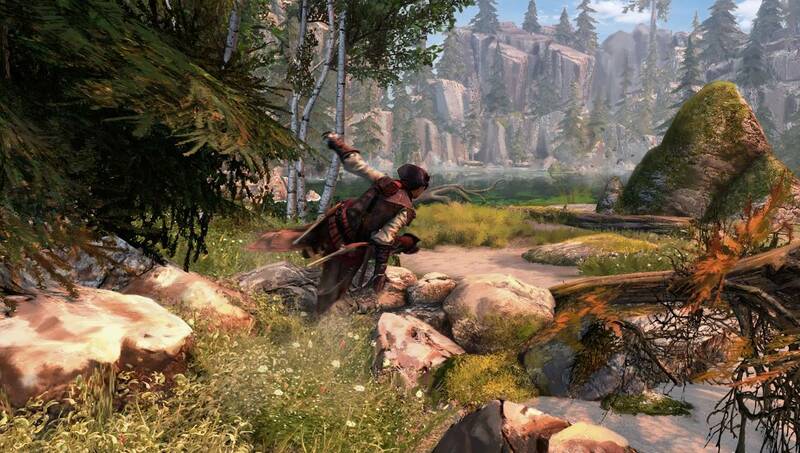 Trottier told us that the game will feature three main ports in addition to surrounding waters and wilderness. 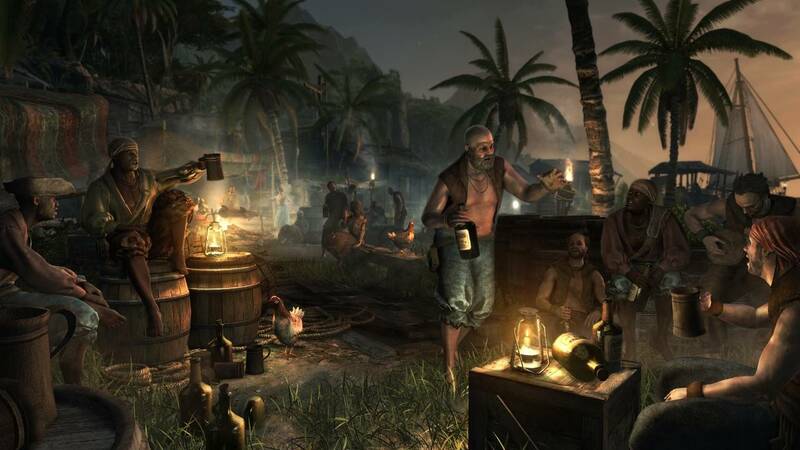 Being that the Caribbean was a bit of a no-man's land with various faction claiming land, players will get the chance to explore the British-owned Kingston, the Spanish Havana, and the popular pirate port of Nassau. Trottier told us with pride that each city will feature unique architecture that is true to each culture. The cities were also bustling enough in real life that gamers wondering if the series' trademark parkour will take a backseat to naval combat needn't worry about it. Speaking of combat, the upgrade system for weapons has taken a page from Ubisoft's own Far Cry 3. 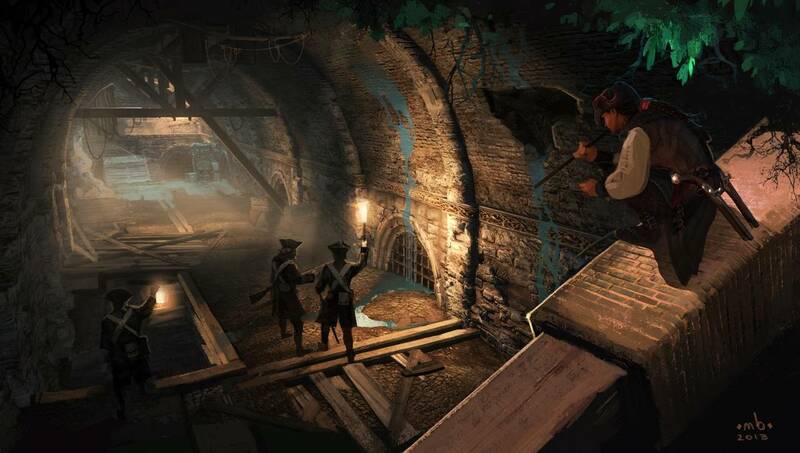 Players will need to upgrade themselves for extra guns, holsters, and better weapons by hunting and finding treasure. 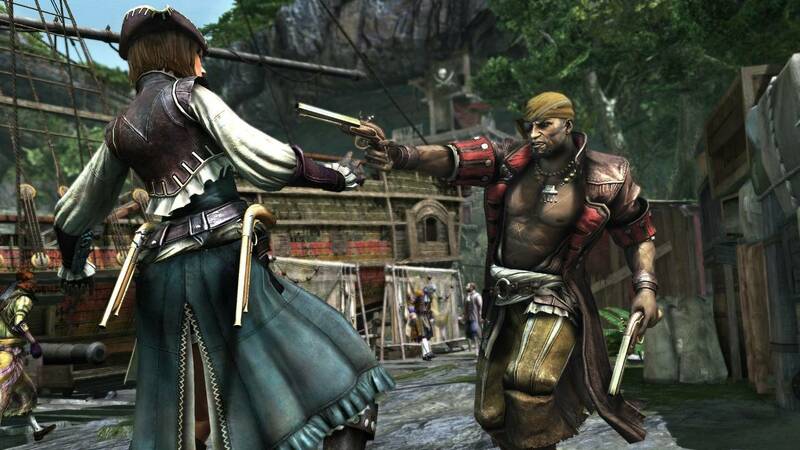 Since guns of the time could generally only hold one round at a time, fully upgrading players means up to four pistol holsters for a quick succession of shots. 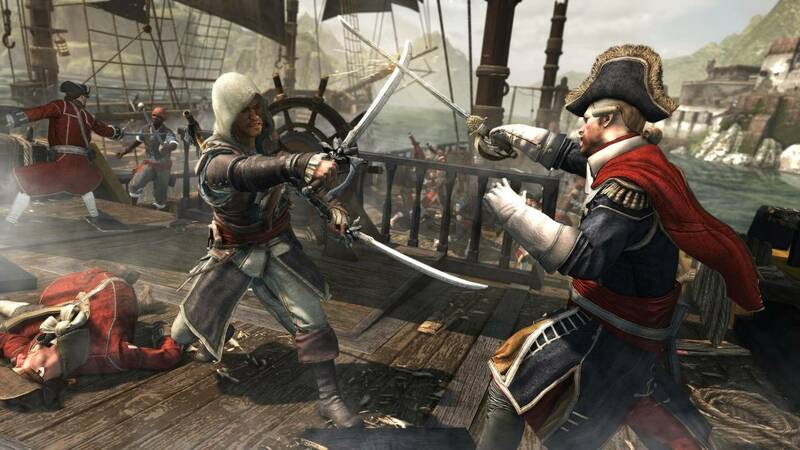 Famous pirate weapons like the devastating blunderbuss and double swords. 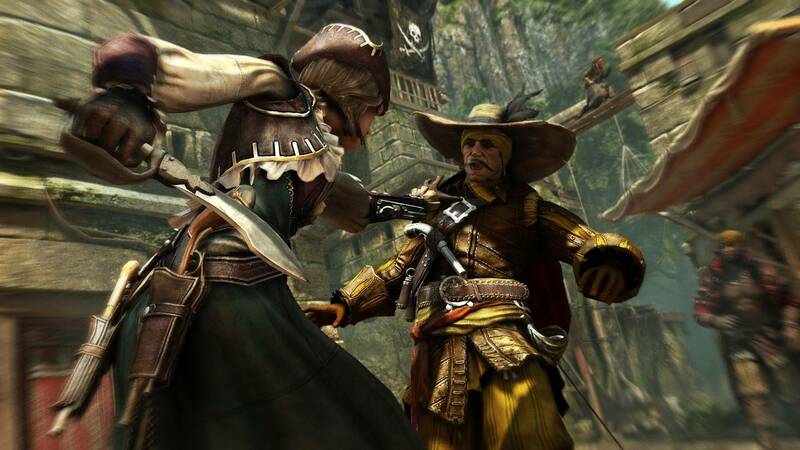 We were also told that the combat system has been tweaked to incorporate more "dirty" pirate moves like low blows and head butts. 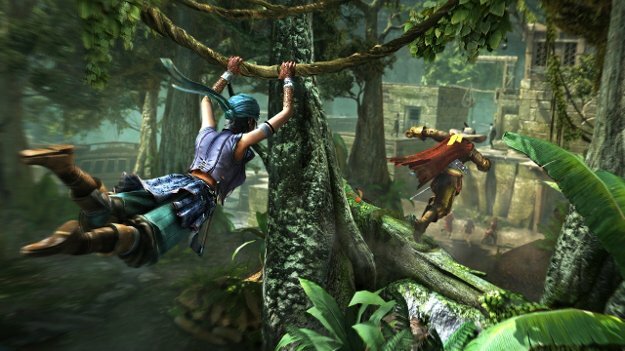 Trottier called it a "down and dirty" version of Assassin's Creed combat. We're really excited to take more ships out for some naval combat, so it's disappointing to learn that there is no naval combat in multiplayer. A bummer to be sure, but what is new to the multiplayer side of things is a mode called Game Lab. This is a social "build your own multiplayer" mode that allows players to tweak tons of modifiers in order to sneak around to murder other online gamers exactly how they want. It reminds me of the sheer amount of settings that the N64 classic GoldenEye used to offer, but taken to a much higher degree of course. The graphics in the game looked great, but considering that this was the first game I laid my hands on for PlayStation 4, I have to say that the game really doesn't look like anything that isn't possible on the current generation of systems. It was confirmed to us that the only major graphical difference between the various platforms is that the next gen versions will run at 1080p, while the previous generation is at 720. Textures, dynamic foliage and frame rate will both be slightly better on the next generation, but considering the next generation hasn't actually started yet, this shouldn't be taken as a commentary of the console's capabilities. The game looks great, with convincing facial animation, gorgeous environmental effects like crashing waves and changing weather, but you'd be hard pressed to tell the difference between the two versions without having them side by side. Since Black Flag is an extension of the engine that was developed for ACIII, it's only fair to point out that I didn't notice any unseemly graphical glitches that were a little too common in the last game. 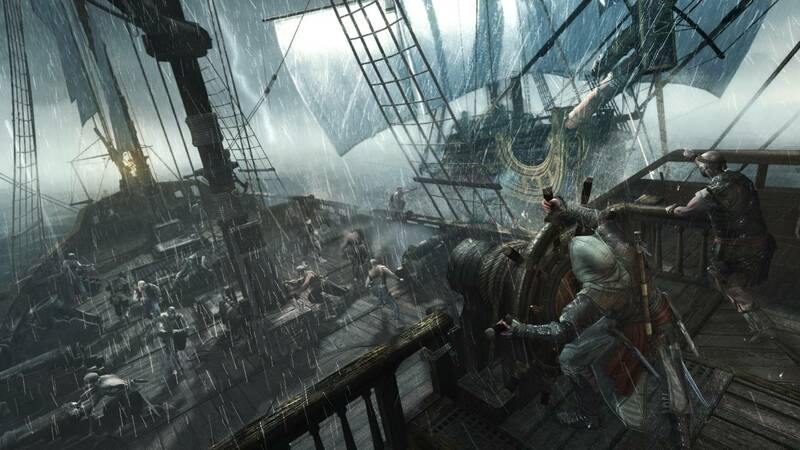 We also had a chance to sit down with Hugo Giard of Ubisoft Quebec City, who is one of the lead developers on Black Flag's DLC. The $10 DLC will include an extra 3-6 hours of gameplay, a new lead character in Edward's first mate Adawale, and will also have a new city of Port Au Prince to explore. We're told that since Adawale is an escaped slave making a living on Kenway's ship, the DLC (and main storyline) will deal with some pretty heavy themes of slavery and the meaning of freedom. The DLC will also be included for gamers who invest in the $20 season pass which will also include multiplayer map packs, cosmetic packs, and more. It's nice that Ubisoft is giving the option to get it all at a discounted rate, or giving those single-player only gamers the chance to get the content they really want as a discounted price. 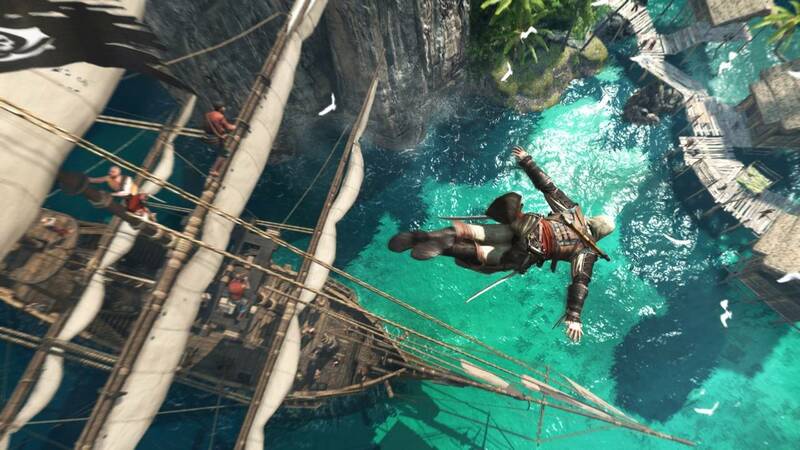 Assassin's Creed seems to be back in a big way, with a bold new setting to boot. What speed bumps were hit in ACIII's development seem to have been taken to heart for this latest installment. We'll have a full review of the game in the coming days, but longtime Assassin's Creed fans like yours truly can jump right into these high seas with full confidence. Yarrr!